About 4.5 billion people in developing countries are low-income, living on $8 a day or less. They are the so-called base of the economic pyramid and constitute a $5 trillion consumer market. However, the success of local businesses has often been lost in the discussion of ‘BoP business’ to date. While case studies abound on many of the well-known multi-nationals trying to break into these markets, why are we not learning from the companies that are already succeeding with the BoP? In the past 10 years, IFC has committed over $11 billion to more than 400 companies with inclusive business models that reach the BoP. These are companies that are doing commercial business with the BoP. They span 90 countries and a variety of sectors, including agribusiness, education, health, utilities, information and communication technology, financial markets, and housing. In 2013, the inclusive businesses in IFC’s portfolio reached over 90 million people, including farmers, students, patients, utility customers, and micro borrowers. IFC’s inclusive business clients are generally not multinational companies, but rather medium to large local companies, or sometimes the multinationals’ local subsidiaries. Many of them are not new to BoP markets. In fact, most have been at it for a long time. Our latest report Shared Prosperity through Inclusive Business: How Successful Companies Reach the Base of the Pyramid summarizes the practical lessons that we can learn from IFC clients that successfully reach these low-income people as suppliers or customers. We analyzed our portfolio of clients, looking for the common factors that enable these companies to reach the base of the pyramid. 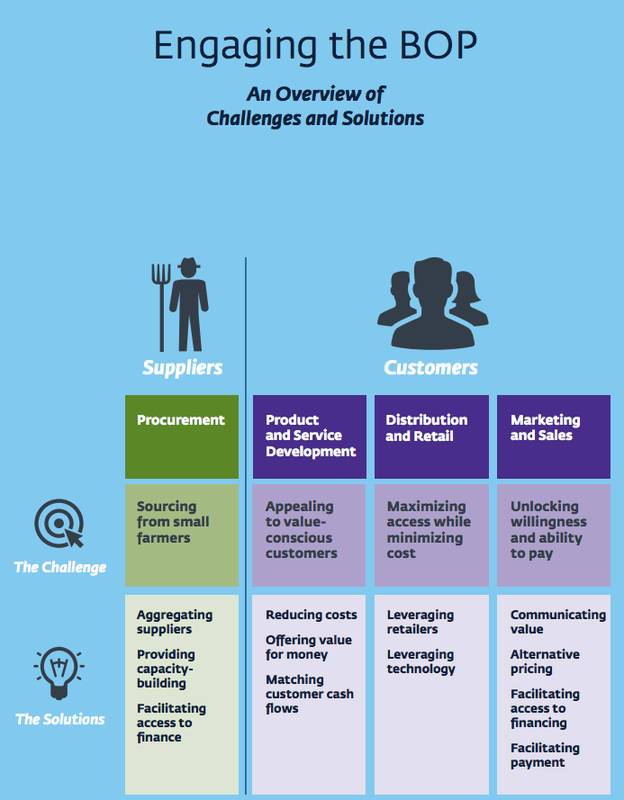 There are lessons for each phase of the value chain — including procurement, product development, distribution and retail, and marketing and sales. The lessons — each of them illustrated with a profile of an IFC client—can also be adapted to the context of a particular sector or region. We believe that the lessons we can learn from these companies — many of which aren’t as familiar to those in the development community — could prove extremely valuable for those companies that are still trying to find success with the BoP. To many local companies, these lessons may seem like a normal part of doing business, but to others, they may be the missing piece to their business model. Also included in the report is a profile of Kenya Tea Development Agency (KTDA), one of the largest tea companies in the world. In order to source from smallholder tea farmers, KTDA offers comprehensive services including training, provision of inputs, transportation, processing, marketing, and access to finance. These techniques allow KTDA to expand and diversify its supply base and offer locally-sourced quality tea, while at the same time improving the incomes of its suppliers. There is no single magic combination of these solutions that will work for every business, nor is the combination of solutions static over time. Once a company has built these solutions into its business model and implemented them on the ground, it is imperative to keep testing and refining them to find the most effective combination. Eriko Ishikawa is Global Program Manager at the IFC. Kathleen Gaertner Mignano is Associate Operations Officer at IFC.